Two flags, but are they two American flags? Photo by Ryan Sitzman. Who or what can be considered “American,” at least in English? This is one of the most common questions/complaints I get in my English classes. As you probably know if you have friends from the USA, we often refer to ourselves as “Americans.” I was recently listening to a Grammar Girl podcast that talked about this very issue. You can see the transcript or listen to the podcast here. The episode is great listening practice, of course, but some of the English is a bit advanced, just so you know. In the USA, as well as much of Canada, Europe, and other regions, we learn that there are 7 continents, and that North America and South America are two different continents. However, in Latin America, schools teach that North and South America are combined, and that the continent is called “America.” As a result, in Spanish you can refer to anyone or anything from Alaska to Argentina as (an) “americano/a.” This is a small difference in names, but it can cause bigger problems in cultural communication. 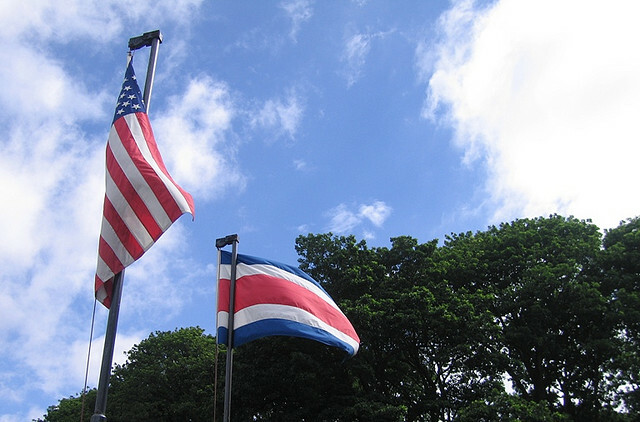 If I refer to myself as an American in a class in Costa Rica, some of my students complain and say something like, “We are Americans, too.” Sure, that’s true. But they’re also Costa Ricans. Or in South America, they’re also Argentinians, Venezuelans, Peruvians, etc. The USA is at a bit of a disadvantage because there’s not a word that can describe the people from the country, at least not in English (estadounidense works OK in Spanish, but there’s not an equivalent in English). Another issue that comes up in classes is the use of the word “North American.” In Costa Rican Spanish, “norteamericano” is often used to refer to Americans and Canadians, but only sometimes Mexicans. It’s a confusing term, especially if you’re talking to a person who learned that Central America is part of the North American continent. I tell my students that according to geographers in the USA, Costa Ricans are also “North Americans”! Even if you eliminate the “norte,” it doesn’t necessarily make things less confusing or controversial. Just try calling a Canadian or a Mexican an “americano” and you’ll see what I mean. Basically, this is my message to my Costa Rican students and other readers in Latin America: If a person from the United States of America calls himself or herself an “American” when speaking in English, please don’t take offense. They’re not saying that you aren’t Americans, too, but there’s just not an English word that lets us describe our nationality in another way. If both English and Spanish speakers keep this in mind, it can help us avoid some cultural and linguistic misunderstandings. How about gringo? I heard it came from the words greens go by the time of the green berets, when they fought in Vietnam or another war but I am not sure if that is the origin. Do you considered gringo offensive? Juan – I’ve heard a few theories about “gringo,” but none of them seem to stand up to examination (plus, if it came from Vietnam, then the people calling us gringos would be the Vietnamese, not the Latin Americans, so that doesn’t seem to check out). I’m not sure I’d consider it offensive per se, but it all depends on who’s saying it, and if they mean it to be offensive. I could even say “Tico” with a specific intonation and make it sound offensive, probably. Also, who should be called “gringos”? That seems problematic, too. If you do it based on appearance, then a lot of Canadians, Europeans, and probably even Australians like Lucy would get called “gringos.” Try calling Lucy that to see what she says. And if it’s based on “Americans,” then if we’re all Americans, then you’d be a gringo, too. Yes it is complicated. I think Gringo actually comes from Mexico and it is a Latin America thing, related to USA citizens. I have never heard an European calling an American gringo, for many people, if a person speaks English, that is enough to call them gringo, they are based on the language, the same happen with Asians, they think they are all Chinos just because their faces. Lucy, would you get upset if someone calls you gringa? Sure, but Central America is a region, not a continent, and part of the issue at hand here is what we consider a continent. And what about the Caribbean? Where does that all fit in?